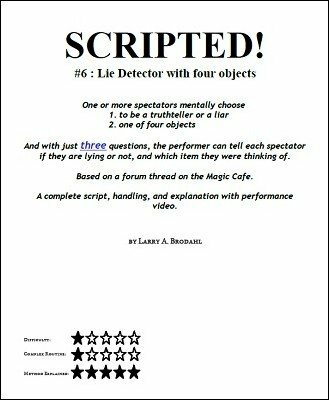 Imagine a self working trick that uses 4 objects and only three questions that allows you to determine which object or objects the spectator(s) are thinking of. Now add fun, misdirection, and a performance video. One of the more difficult tasks facing magicians is coming up with scripts - of any sort. Especially a routine where you have 1 or more audience members mentally select any of 4 objects and then answer 3 questions with either lies or the truth. And you identify the truthtellers -vs- the liars, and you discern which object they were thinking of. This ebook and the performance video gives you every line, joke, piece of timing, setup and nuance of the routine. The ebook also takes you through the an overview of the steps of script writing that were used to create the scripts. This routine has been performed for audiences of all types and ages 10 and up. The core concept comes from a forum thread on the Magic Cafe. 1st edition 2016, 22 pages plus video. Four items with three spectators I believe puts this Liar/Truthteller routine in a class by itself let alone the fact that Mr. Brodahl gives you a solid premise for why a magician would even care about being able to tell a lie from the truth. If you've read any of his other offerings, you know that the author's attention to detail is second to none. This is no exception. And as I get older, I appreciate more and more that he also figured out a way to minimize any memory work. Thank you Larry. If you love hearing your audience laugh you sure will enjoy this presentation of the lie-detectors plot.